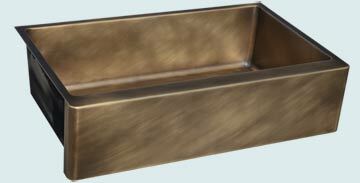 Custom Bronze Farm Sinks | Custom Brass Farm Sink | Bronze Farm Sink | Brass Farm Sink | oil-rubbed bronze sinks. Custom bronze farmhouse sinks and brass farm sinks from Handcrafted Metal are made to perfectly meet your kitchen needs. Every feature can be customized, including the number, shape, and size of the bowls. Choose from additional features, such as drain boards, towel bars, woven aprons, and backsplashes to further personalize your sink. 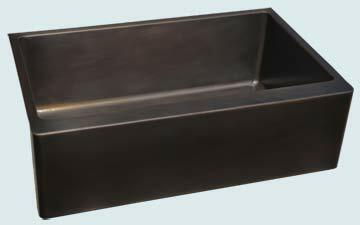 Each bronze sink is fully welded and polished, and made with sturdy 16 gauge bronze. 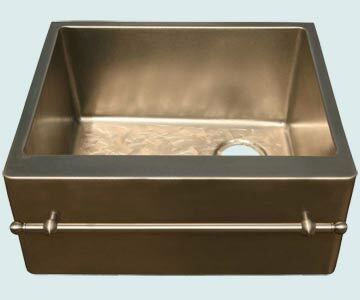 Also, each brass sink has coved corners inside for easy cleaning, and can be made with drop-in mount, under mount, or flush mount rims. Click on any sink below to see more pictures, and customize it according to your specifications! Rounded on the left and right sides of the apron, this sink extends past the counter top overhang. The medium antique brings out the beauty of the smooth bronze. Made from 16 gauge bronze. 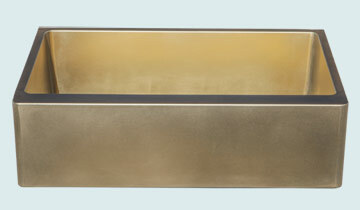 This sink has a natural Matte finish with no antique, which brings out the gold color of the bronze. It's made from 16 ga. pure bronze. The veggie sink in the center is in front of a side deck for the faucet holes. The 2 larger sinks are equal in size and very deep. A square apron is designed to match the overhang of the counter top. It's made from 16 gauge bronze (naval brass) and has an oil-rubbed Dark antique patina. 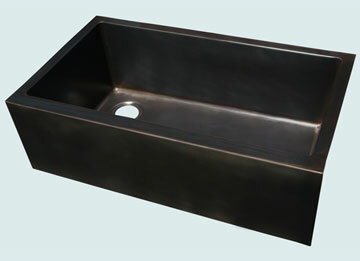 A stunning bronze undermount farmhouse sink! The bottom of this sink is strongly sloped to the left rear drain. It's made from 16 gauge bronze (naval brass) and has an oil-rubbed extra-dark antique patina. 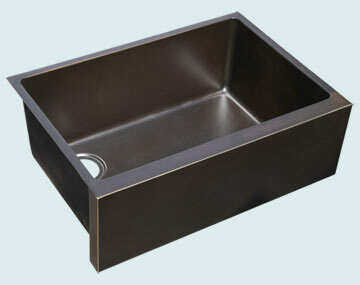 This bronze farm sink is a fabulous addition to any kitchen. To make it darken, just let it age naturally. The bottom of the sink has our butterfly pattern, and the rest of the sink has our matte finish. The matching brass towel bar is both useful and visually interesting. The right rear drain position leaves maximum clear space in the bottom of the sink. It's made from 16 gauge bronze. 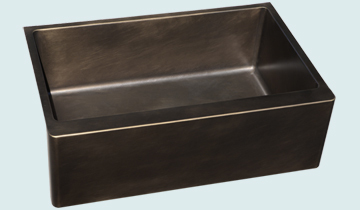 This gorgeous bronze sink has a distinctly antique appeal. It features an apron on the front, with a matching towel bar on it. 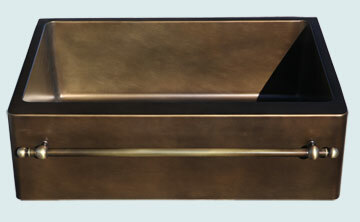 It's made entirely from 16 gauge bronze (naval brass), and is antiqued with our "Medium Patina" finish.